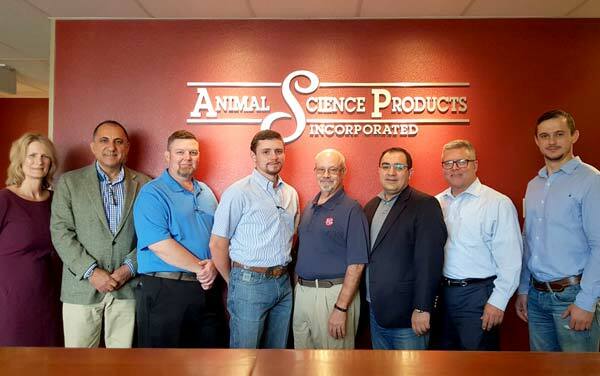 Nacogdoches, Texas – Animal Science Products, Inc., an industry-leading manufacturer and global leader in vaccine stabilizers, gel application products, and non-antiobiotic intervention products, welcomed our UAE Distributor, Agrovet Alliance, for a plant tour and general meeting. Our guests representing Agrovet were Reza Nick Nikooforsat, Managing Director, and Dr. Dieyar Kakel,Vice President of Business Development MENA & Indian Sub-Continent, who is relatively new to the company. The meeting concluded with a tour of our facility and discussion surrounding our quality program. Animal Science Products, Inc. is a family owned and operated business that was founded in 1985 to service all facets of the feed and food animal production industry. The company currently has sales throughout the U.S. and in over 30 countries.